Rapid Prototyping Plastic Parts – Pittsfield Plastics Engineering, Inc. Rapid prototyping has come a long way from its inception in the 1980s. Once limited to scale models and prototype parts, this technology is now utilized to manufacture production quality components and by artists for complex shapes. The process involves slicing an intricate three dimensional CAD model STL file into thin virtual horizontal cross sections, which are then “printed” in real space using a liquid, powder, or sheet material. This method of adding layers one on top of the other is additive fabrication – obviously advantageous for producing any shape or contour. Some of the freeform techniques actually employ two materials: the part material and a support material that is used to prop any overhanging features. The secondary material can then be removed via heating or dissolution. 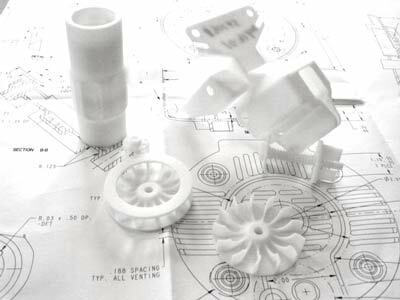 The popularity of rapid prototyping for producing small quantities of production parts has led to the growth of multiple competing technologies. All of them are additive fabrication, but they differ in the materials used and methods for building layers. The most common methods are melted material layers, laying liquid layers to be cured, or lamination processes.